A very Summery combination with sweetened mango, shredded coconut and tangy lime in a buttery scone. Since I've started my blog, I've wanted to create a recipe that has mango in it because it is one of my favorite fruits and fruit juices. I want to do this combination because it is sweet and refreshing to cool you down because of the heat. Where I live for the last month the highs have been in the 80's to mid 90's with 1000% percent humidity. Also my niece and nephews are ending their school year today, when I put up this post, and I wanted to create a treat that I know that they will like because they love mango, lime and coconut. In my previous post of scones, Meyer Lemon Cranberry and Milk Chocolate & Orange Scones, I shaped them in the nontraditional way. This time I did more of the traditional in the shape to look like a biscuit. 1. Freeze butter for 2 to 3 hours or until frozen solid. You want really cold butter. 2. In a large bowl, combine flour, sugar, fine sea salt and baking powder. Grate in frozen butter and gently toss in the flour mixture until the butter is well incorporated. Zest limes into the flour mixtures. 3. In a small bowl or measuring cup, whisk together heavy cream or buttermilk, egg, lime juice and vanilla extract. Add mango and shredded coconut and toss. At a two tablespoons at a time, gently work the dough with yours until the dough is slightly sticky. If you are using canned or fresh it will be a stickier dough, just add a little flour and it should help that out. 4. Cover dough and let chill for 30 minutes. 5. Preheat oven to 350 degrees and cover a cookie sheet with parchment paper. Scoop dough out using a 1/4 to 1/2 measuring cup, depending on the size that you want, drop onto prepared cookie sheet. Brush the top of the scones with the 2 tablespoons of milk or cream and sprinkle on more shredded coconut, if you like. Bake for 25 to 30 minutes or until lightly golden brown. 6. Let scones on the pan for 10 to 15 minutes then transfer to a wired rack to cool completely. While the scones are cooling whisk together the lime glaze until thick. Once the scones are cooled drizzle glaze and let set to 20 to 30 minutes. If it were already in the eighties or nineties here I would move into the fridge. I guess I better stop complaining about the snow. School is getting out there already? The children have exactly a month left here. Those scones look delicious and I love coconut! Oh yummy! We love mango but I hadn't thought to add it to scones! We'll have to try this next time. I like the combination of mango and coconut a perfect summer treat with a iced coffee. What a cool twist on the scone! I never would have thought to put mango or lime, sounds like a good breakfast or dessert for summer! Looks yummy! I'll have to try your recipe soon. Thanks for sharing! These are so delicious and very easy to make! I will try for sure, my bf loves mango and I love coconut, so its perfect. This looks so yummy! I pretty much love anything with coconut and the mango makes me think of summer. Sounds so good! oh my, these scones have my fav mango, coconut and lime - love all three ingredients so this is scone perfection for me! I think the flavors are perfect for the summer! I've always loved mango. The scones are definitely worth it! This made me super hungry. I love mangoes. I live in a tropical country and we have a wide range mangoes. I've never thought that Mango and Coconut works well together. I'll definitely try this recipe! I love the flavor profiles in this recipe. Coconut is one of my favorite fruits and I just put mangos on my shopping list. Definitely bookmarking this recipe to try! These sound perfect for summer! I love the flavour combinations! We were lucky to try this last night and it was so delicious. I loved that it was easy to prepare yet so good. I can't wait to make this on Wednesday again for a small gathering at home. Thank you for sharing the recipe. I'm so happy that you try the recipe out and they came out great. Now that summer is here, it's mango time. The dish that you shared looks so good.. Will try it out for sure! I love scones but have never made them myself. I need to try it. Coconut lime is a great flavor combo. This looks delicious! I love mangoes since I came from the Philippines! They are so good! This sounds so good. I only like coconut with certain flavor combinations, but with mango sounds like a winner. Yum! I'm a big mango fan..never thought to combine mango with coconut lime. Perfect for summer! Mango and Lime is an amazing combination! That looks so delicious. Those scones looks so good and tasty. I will definitely try to make this on weekends and I am sure they will like it. Coconut and mango? That sounds like heaven! Although I don't know how I feel about the lime.. I think I might be able to make a paleo version of this recipe because I'd love to try it. :) I love coconut everything! Another savory delight of flavors. 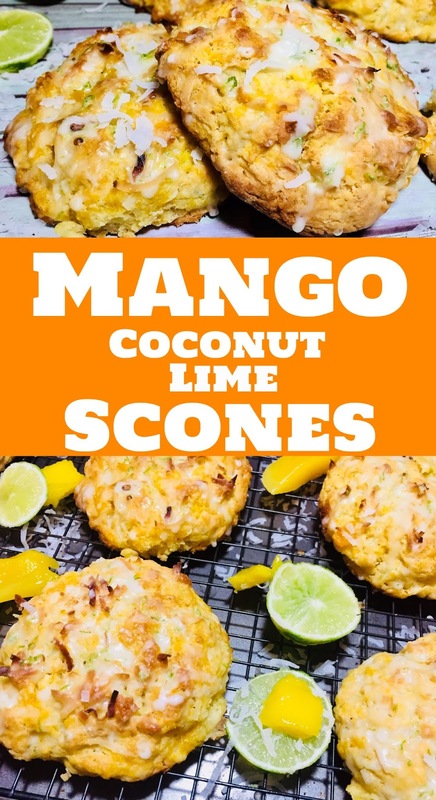 My husband loves coconut and lime, I love mango - can’t wait to give this scone recipe a try! Mmmm, mango, coconut and lime... what a yummy combination!! I will have to try this! I'm not a coconut fan but I love mango this looks tasty and i'd love to try them. I love the combination! Mangoes are one of my favorite fruits too. I also like coconut and my mom sometimes makes lime juice. I will have to try this sometime. I don't know anyone who doesn't like mango or coconut! Perfect for the summer, thanks for sharing! Omg, these scones look delicious! They look even better than the Cobs Bread ones!! The ingredients involved in this recipe just fits my wants and needs easily. A perfect 10 for me! I would love to have this over the weekend. Mango and coconut is a great combination. I am tempted to try this out soon. These look amazing. Can't say I've ever met a scone I don't like. Adding this to my MUST BAKE list now. These look so delicious and refreshing! Would be a perfect addition to a summer BBQ menu! wow I have never made scones and have not tried them with mango this is so delightful and clever, send me one please =) I want to try!